So, we've been neglecting the Accordion Room for a few months, which was all well and good while we were neglecting it, up until we realized that we have a friend coming to visit from out of town TODAY and we sort of need to have the room usable, if not presentable. Last week we had a series of nights in which we poured Safest Stripper on the floor to try to remove the majority of the paint there, which was fairly predictably not terribly effective (in our experience, lead paint really doesn't come off with most commercial paint strippers; you have to use a heat gun). 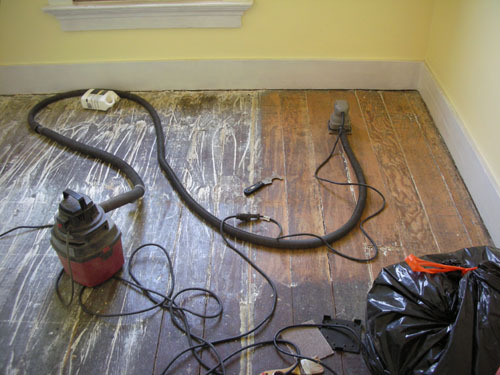 So then Noel tried the heat gun, which was slow and didn't leave the floor looking very good, and then we applied the sander, which worked very well, but mostly so on places where the heat gun had removed the big stuff like fields of stick vinyl mastic. On the right you have the sanded area, looking good but perhaps too good: we're going to repaint this floor (um, eventually, not before our houseguest arrives this afternoon). On the left is the remnants of Safest Stripper, waiting to be scraped off. We divided the work and changed sanders: in addition to this little palm sander (nice for small areas but not nice for entire floor surfaces) we have a 6" random-orbit sander that attaches to a dust collector (critical when you are sanding lead paint off your floor). I used the heat gun and scraped while Noel vacuumed up the scrapings and sanded. Two hours and one popped breaker later, we had about 60 percent of the room sanded, and about eighty percent scraped. I also had about four burns from clumsy handling of the heat gun (this always happens), and Noel's arms were tingling from the vibration of the sander. 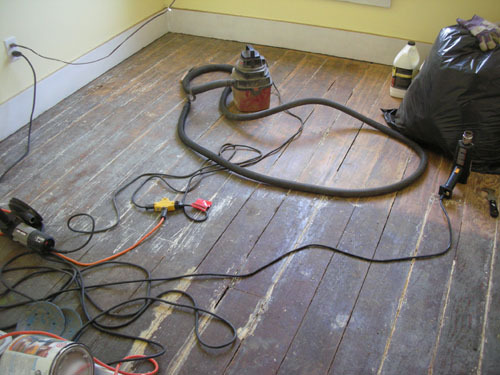 The worst parts are where a bed wore down the floor over many years -- the wood is chewed away, then somebody tried to fix it by filling it in with vinyl mastic. (You may be able to make out one of those areas, now cleared of mastic, in the upper left corner of the room, about two feet from the front wall.) If that sort of thing ever happens to you floor, caulk is not going to make it better so just go get an epoxy wood repair kit. Or replace the boards, but finding these old pine floor boards requires a certain amount of patience and persistence (or a friend who does floor refinishing). This morning we will remove all the random stuff from the room (including the wrapped bundles of asbestos tiles and our dropcloths from the abatement we did months ago) and finish the floor. I think it's a couple of hours of work to finish the sanding and clean the room. Then we can move everything out of the hall and our bedroom, which will be nice. It will also be helpful for Roomie John, who is moving out at the end of the month and might like to have a bit of room in the hallway for that exercise.